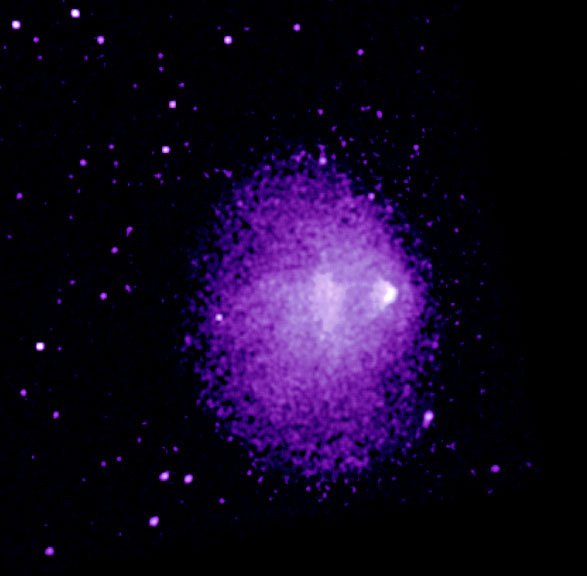 Chandra's image of the extremely hot galaxy cluster 1E 0657-56 reveals a bow-shaped shock wave toward the right side of the cluster. This feature, thought to be the result of the merger of a smaller group or sub-cluster of galaxies with 1E 0657-56, gives astronomers a rare opportunity to study how clusters grow. The shock wave appears to have been formed as 70 million degree Celsius gas in the sub-cluster plowed through 100 million degree gas in the main cluster at a speed of about 6 million miles per hour. This motion created a wind that stripped the cooler gas from the sub-cluster, similar to leaves from a tree being blown off in a storm. The speed, appearance and shape of the sub-cluster indicates that it would have passed through the core of the larger cluster about 150 million years ago. 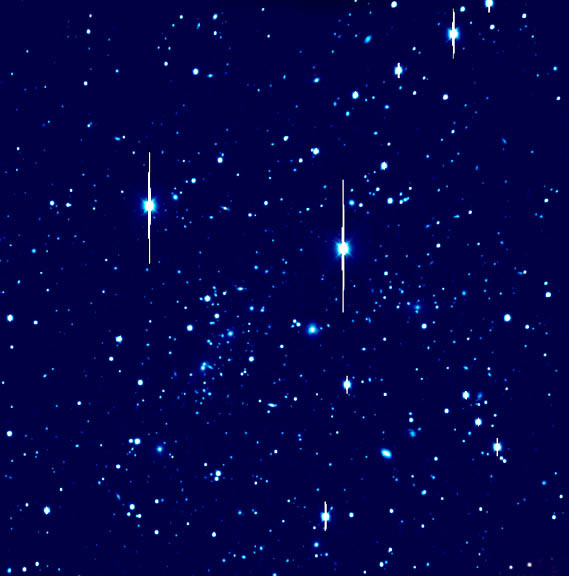 By the time the gravity of the cluster stops the motion of the sub-cluster, it is likely that the cooler gas will have been totally stripped. 1E 0657-56 is of great interest because it is one of the hottest known clusters. Astronomers hope to use this and future observations to determine if the high temperature of the cluster gas is due to shock waves produced by the merger of many sub-clusters. Scale Image is 9 arcmin on a side. Coordinates (J2000) RA 06h 58m 37.9s | Dec -55° 57' 00.00"